Kingdom Builder expansion 1: Only playable with the basic Kingdom Builder game. Includes 40 settlements for the 5th player. The nomads are roaming the kingdom and bring along their special skills. Four new terrain types with attractive locations allow an even more variable setup. A new type of Kingdom Builder card enables the players to gain gold even during the course of the game and thus increases the interaction. 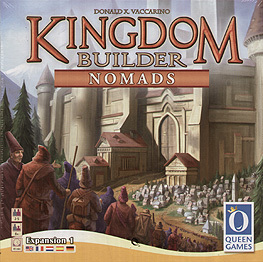 This is the first expansion for Kingdom Builder providing New Boards, Scoring Cards, Actions as well as pieces for a 5th player. The new scoring cards are all instantaneous scoring which adds a new twist to the scoring mechanic, the new additional actions and playing boards help to keep the game fresh. I really like this new addition to the game, so much I see no reason to ever play just the base game again. The artwork and components are superb again and blend right in with the original. They even supply a couple of replacement cards for the original game so the wording includes reference to the new board elements, which is a nice touch. Well worth getting in my opinion.